I put myself often enough in the shoes of the others – in the shoes of her father, of [her husband] Edward Bayes and even of Cromer-Blake – to know without doubt that she showed none of them the least consideration. I put myself above all in the shoes of Edward Bayes and I remember on one fifth of November, nine months after we’d met – I rmember the date because it was Guy Fawkes Day and from Clare’s study window, in All Souls, in Catte Street, across from the old Bodleian Library and the Radcliffe Camera, I could see some little boys begging pennies for the guy they’d made for the occasion out of rags, string and old clothes to represent the executed plotter Guy Fawkes, who is burnt that night on bonfires throughout the land – when I put myself into his place (in the place allotted to him but perhaps never filled) that Clare confused me with him. observations: This should be read with the previous entry on this book, which also featured shoes, in a more literal sense. All British people would know about Guy Fawkes, but it probably seems a strange custom to foreigners, and the narrator is visiting from Spain. 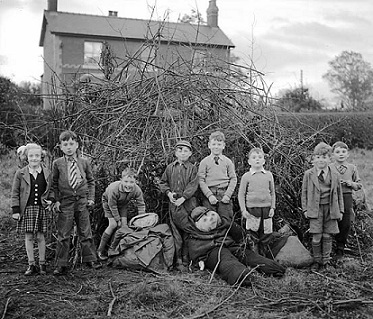 The children collecting ‘a penny for the guy’ were traditionally raising money for the firework display to accompany the bonfires. The book is full of little side issues like this one (there is nothing more about Guy Fawkes) – there is also a discussion of whether Anna Karenina should actually be published as Anna Karenin in English-speaking countries (translation is one of his major themes), a very funny and recognizable description of why English beggars are different from their European counterparts, and a fascinating theory on the different ways men and women look at children. Also an outstandingly hilarious description of a disco night at an Oxford nightclub. There are few writers who are so engaging and so funny, while at the same time so serious. Links up with: Anna Karenina features here, there’s a beggar in this extract, and Armistead Maupin’s hero likes disco too. This stunning picture - look at them in their miniature suits, and the kilt, the ties, the windbreaker - was taken on Guy Fawkes Day 1954, and is from the National Library of Wales.